Glasgow Airport began its life spread between two, primarily military, airfields: Renfrew and Abbotsinch. In 1943 Abbotsinch, the larger of the two, became a Royal Naval Air Station, with Renfrew assuming the role of Glasgow's airport after the war. It was not until 1966 that Renfrew was closed and Abbotsinch was officially opened as Glasgow Airport. However, by the end of its first year in this role over a million passengers were recorded as having passed through its gates. BAA bought the airport in 1975 and began a plan of extensive expansion which, by the late 1980s, meant it had the capacity to handle over 6 million passengers annually, a number which grew further in the 1990s as Prestwick lost its monopoly on transatlantic flights. Glasgow Airport, has, for many years, been the busiest fixed-wing airport in Scotland. Although it has since been overhauled by Edinburgh, particularly with regards to passenger numbers, Glasgow still currently accommodates 8.1 million passengers a year and over forty airlines. Further expansion is planned for the future. 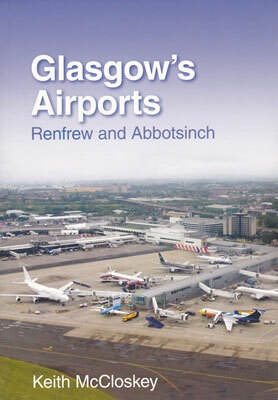 This illustrated book covers the histories of both Renfrew and Abbotsinch, bringing the story to the present, as well as looking at what the future might hold for Glasgow Airport. ...thus both sites have appealing photographic potential as far as the range of aircraft types is concerned, and pictorially this book exploits that to the full, with a good number of illustrations, both monochrome and colour.